Shopping for Weird-Ohs Model Kits? Daddy, the way out suburbanite is back! The classic, bizarre model kits are back with the wackiest car-icky-tures that you know and love! 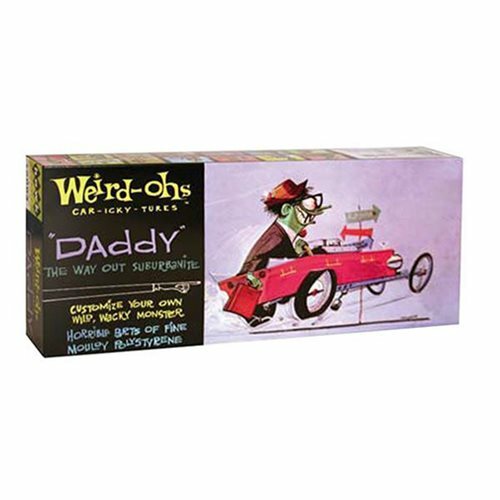 The Weird-Ohs Daddy Model Kit features a wacky buildable character, an easy to assemble molded vehicle, and comes packaged in a retro box collectors will appreciate. Collect and create all of the Weird-Ohs for a complete kooky collection! Measures about 14-inches long x 6-inches tall and brushes, paint, and cement not included. Ages 8 and up.